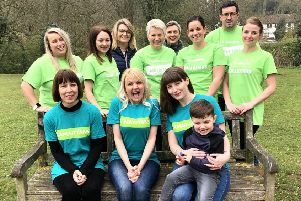 A group of walkers have helped to provide five holidays in Mablethorpe for families who are battling life-threatening conditions. In total, 22 people laced up their walking boots to tackle a 13.1-mile route across the coast to support the Me & Dee charity which provides trips to the local seaside for people who have terminal or life-threatening conditions, as well as seriously injured military personnel. Thanks to the generosity of the town, the charity - which was originally based in Derby - has gone from strength to strength and now has a fleet of four caravans and three beach huts in the Mablethorpe area, helping to turn dream holidays into a reality. Founder of the charity, Maria Hanson (MBE) said: “A huge thank you from me and from the heart of Me and Dee. “Mablethorpe has embraced me and my charity and I cannot think of a better place to have our memory making homes by the sea. Debbie said: “I would just like to personally thank each and every person that took part in the walk, including those who came in fancy dress, and also to the people that travelled all the way from Derby to take part. The holidays provided are worth around £200 each, at no cost to the recipient, and every attempt is made to access individual needs and requirements. The aim on the day was to raise £1,000 - which would have provided five holidays for five families - but the total has already been exceeded with more sponsor money still to come in. A small buffet was provided after the walk and certificates were presented to the participants by Ms Hanson. A presentation evening will be arranged in the next few weeks, when the final total will be announced. “Following the success this half-marathon walk has seen, I now want to make it a yearly event.” Debbie added. If anyone wants to get involved with the charity please contact Debbie on 07832 952056.